Design is the thoughtful link between dreams and realities. Visions of a sustainable building technology lead to solar and non-toxic homes. Start with a desire, then collect some ideas that appeal to your sense of beauty and harmony. 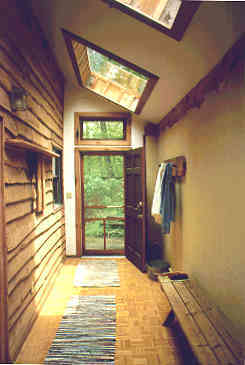 Any style, whether it be a rancher, colonial, or contemporary, can be adapted to solar and non-toxic. Maybe you prefer lines like this one. A building lot need not be a south facing slope. Just take advantage of the sun that's available to you where you are. 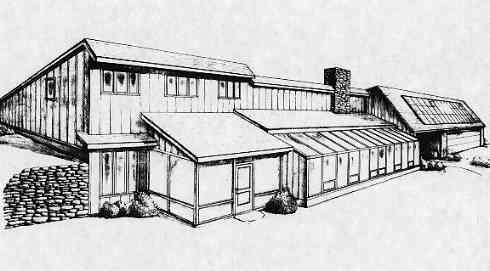 Passive solar design takes advantage of the sun's energy to bring economy and comfort with little or no cost. On this page I'll show you some of the Solar/Non-Toxic (S/N-T) design basics that make a workable home livable and appropriate well into the next century (and beyond). Heat collecting windows facing south can bring in 1000 BTU's net gain per square foot of glass in one day. 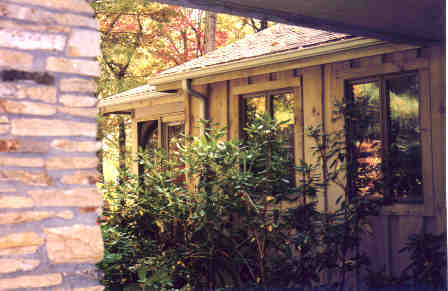 In Asheville, we try to get 15% of the square footage of the house as south facing window area. 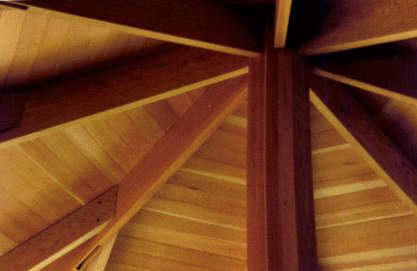 An overhanging roof prevents overheating in the summer. Minimize windows on the rest of the house, but don't deprive yourself of views, ventilation or lighting. Having shown many good examples elsewhere, the photo to the left demonstrates what can be done with an impossible lot. 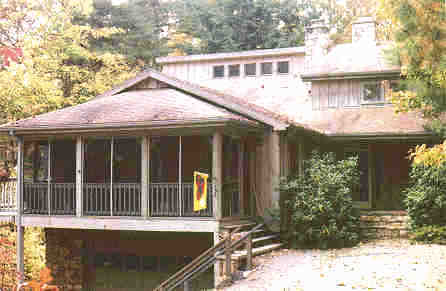 This house was earth bermed on the north side of a steep hill. Two large skylights into the foyer brought heat and light into a difficult design. After window placement, the next obvious step is to insulate the house and conserve the heat captured. There are many effective strategies for this. All techniques should be considered, except for smelly caulks and foams. Once you've tightened up the house, indoor air quality becomes critical. Look carefully at the materials used inside. Plywood, particle board, and carpet should be eliminated or sealed to prevent outgassing. Ventilation is essential, and should address two issues: cleaning the air of pollutants, and preventing the growth of molds. Stale air combined with darkness and humidity can be a sure recipe for mold growth. Insulation is usually invisible in a home. 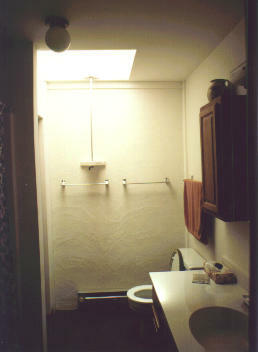 In this photo, a bathroom is ventilated and illuminated by a "solar chimney/light well". The back wall is insulated by earth berming and rigid insulation. Note the crank that extends up into the chimney/light well to open and close the roof window. Building a non-toxic home becomes tricky as soon as you deviate from standard building practices. Craftsmen and inspectors have to break out of their standard routines. Oddly enough, masonry, wood, metal and glass are the standard materials of old, and they are the standards of non-toxic construction today as well. Most modern materials like plywood, particle board, and carpet have historical predecessors that are perfectly viable today. In many cases, you have only to adopt the old methods, and find craftsmen who remember them. Non-toxic and natural finishes are available. Glues are common in construction today, but should be used sparingly. "Low VOC" glues and finishes are easily found, but "No VOC" products are purchased from specialty suppliers like AFM, Livos, Auro, and others. A young girl's mother wanted the protection of a natural finish. 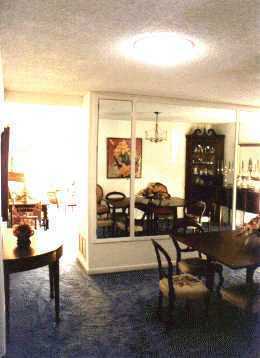 The room on the right was decorated with Livos paint, tinted a light shade of rose. The woodwork was finished with Auro citrus primer and beeswax topcoat. 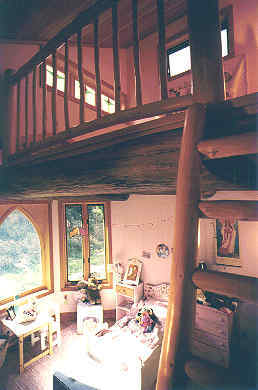 For the loft and rail, we used whole log trunks and branches scribe-fit together. To tackle a powder post beetle problem in the wood railing we chose not to use chemicals. Instead, one heat treatment at 150 degrees took care of it. Daylighting should be part of every design. Natural light has many known advantages over artificial light. It is free, full spectrum (by definition), and dependable. Sunlight has a proven physiological benefit. You can easily install daylight into every room, whether you are remodelling or designing a house from scratch. The house on the left corrected a dark design flaw by installing a Sunpipe in the dining room. The attic above was tall, so it required a 12 foot long pipe. As another example, (in my own house) a Sunpipe brings light down a side wall, turns 90 degrees into the floor/ceiling cavity, to the middle of the kitchen ceiling. Your household energy budget for lighting can be cut by 2/3 with the use of compact fluorescent bulbs. Note that "electronic ballast" bulbs are flicker free and more pleasant to be around than the cheaper "magnetic ballast" bulbs. New fixtures are available, as well as replacement bulbs. With passive solar design and conservation methods, you can effortlessly take care of 50% to 75% of your heating and lighting. The remaining percentage requires backup sources. 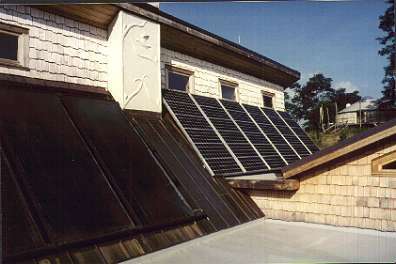 Active solar or conventional heat and electricity are perfectly acceptable. Solar heat and electricity have one benefit that is often overlooked: FUN! There's a deep sense of bubbled up satisfaction that looks like a grin and sounds like a chuckle. It's adult, it's responsible, and it's sexier than a shiny fast new car. On the right is a solar electric array that powers the whole house. The panels are Kyocera multicrystaline, inside are Trace inverters and Absolyte sealed batteries. A Honda generator provides backup. The hot water panels in the foreground heat 160 gallons of water for domestic use.